Cleansing oils - they will always hold a special place in my heart since they were one of the first skincare products I dabbled in when I began blogging. Prior to blogging, I would basically use skincare from whatever brand I was working for at the time and there was no rhyme or reason with how I treated my skin. Then I began using cleansing oils and saw such a drastic difference in breakouts, oiliness and overall appearance that I started to take a more invested approach in my routine. Fast forward a few years and they are a staple for me both to remove makeup and to condition/cleanse my skin. 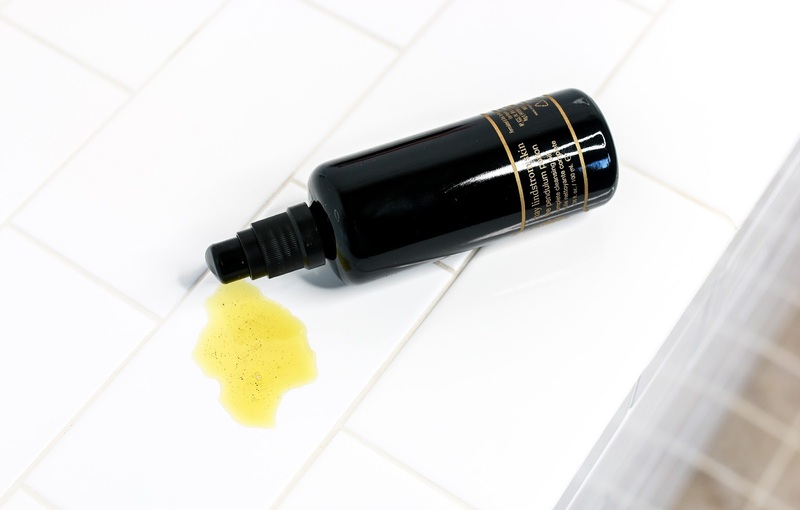 Though I have tried a few things from May Lindstrom's line (read prior reviews here and here), I had never experienced her Pendulum Potion Cleansing Oil. My first thoughts when using the cleanser on my face was 'this is more like a treatment than a true cleanser and I want to treat it as such'. The texture is thicker than a majority of my cleansing oils so this is not a makeup remover/first cleanse/break through dirt, grime and sunscreen type of cleanser. This is the type of cleanser that I would use as a second cleanse so I can massage it in, let it sit for a minute or two so all the glorious oils and ingredients can fully work their magic on my face. I did need a washcloth to remove this since it is quite thick, but my skin truly felt like it just had a facial afterwards. In fact, the first night I used this I actually skipped the rest of my skincare (3rd trimester exhaustion is real, ugh) and my face still felt nourished and moisturized as if I had continued my full routine. This cleanser is truly for the avid skincare lover who will really appreciate the rich texture formulated with camellia oil, avocado oil and wild botanicals designed to expertly condition the skin. The scent is strong with notes of jasmine, ylang-ylang and raw cacao so the whole experience using it is quite sensorial.